Anything but bland is what we like to say about our products. At Danze, we want faucets to do more than just washing your hands and vegetables. Our bathroom and kitchen faucets are designed to delight your senses and make your day just that much brighter! Explore the new KOHLER Signature Store by Studio41, a one-stop kitchen and bath showroom featuring products exclusively from the Kohler brands. One of the finest showrooms in Chicago with a full team of engineers, designers, architects, trade professionals, and skilled craftsmen at your disposal. 25,000 sqft showroom, largest emporium in the Midwest! Northwest Indiana's, Chicagoland and Southern Michigan's Premier Decorative Kitchen, Bath, and Lighting Showroom for over 60+ years! We create experiences that bring your dreams to life. Design is more than choices, it’s an expression of who you are. It's our desire to see that expression take life in your home. Because isn’t it beautiful when it all comes together. We provide everything you need to complete your kitchen or bathroom project. Experience Inspired Kitchen + Bath in our newly redesigned, state-of-the-art showrooms featuring stunning lifestyle displays with working faucets, toilets, showers & tubs. European Freestanding Bathtubs and Sinks made of Silkstone. Smooth, beautiful and SPA like look and feel. Luxurious quality at great prices Always Free shipping. We specialize in decorative hardware for any space. Whether it’s bringing to life a dream kitchen, bath or any other room that requires fine cabinetry work, let Christine Beehler and her team show you how to get exceptional design and service without the high-end price tag. Many kitchen and bath designers depend on factory produced cabinet sourcing or expensive brand names. But the Beehler Advantage comes from custom cabinets built to order by Amish craftsmen in southern Indiana. Their lower cost structure is passed on to you without any sacrifice in workmanship or delivery. In fact, you may be surprised to find the fit and finish surpasses many of the cabinets on the market today. Combined with imaginative space planning in creating the look and feel that’s right for you, the results, well, speak for themselves. Equally important to your project may be the desire to work with a single source…from tear-out and removal to new utilities, tile work and finished installation. Rest assured the Beehler team is there every step of the way. Birom Cabinetry is the premier source for unique, handcrafted custom cabinetry for you home. We work with the desire to design and built the finest furniture possible. We only use high quality wood, materials and finishes. Best hardware available. We offer a wide range of innovative accessories and features to make your life easier, more efficient and more organized. Kalma Custom Woodworks, Inc. is a leader in the woodworking industry. Through custom design and precise installation, our cabinets radiate with personality while meeting functional demands. We offer a completely customized product that is designed, built and installed by our skilled team of tradesmen. From beginning to end, open communication ensures the result you envisioned for your home. 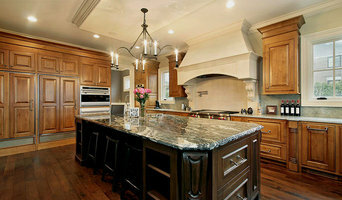 Specializing in kitchen and bathroom remodeling and design This is the house that JAK Built designed especially for you. As creative design consultants, JAK Built has the vision to custom design your house for you. The modern kitchen cabinetry, that JAK Built. The custom designed marble and stone countertops, that JAK Built. The stainless steel appliances, that JAK Built, with the vented built in range. The Bosch built in dishwasher that, JAK Built, with custom maple cabinetry. These are the hardwood floors, that JAK Built. The unique body spray system, that JAK Built, in your custom stone shower. This is the luxury rain shower with hand held sprayer and Grohe diverter system, that JAK Built. This is the shower bench, that JAK Built. This is the drop in Koehler soaking tub, that JAK Built. This is the luxury sculpture tub, that JAK Built, with inlaid stone and accent tile border. This is the glazed subway tile, that JAK Built. This is the custom poured shower base, that JAK Built. This is the house, that JAK Built - Turning the kitchen and bathroom that you dreamed of into reality, specifically for you. *Authorized KALLISTA Plumbing Dealer* Experience Inspired Kitchen + Bath in our newly redesigned, state-of-the-art showrooms featuring stunning lifestyle displays with working faucets, toilets, showers & tubs. Explore the latest innovations in plumbing & finish fixtures at highly competitive prices. Our talented designers and plumbing specialists rely on extensive experience in kitchen and bath remodeling to guide you through the design process from selection to solution. Visit us at one of our locations in Chicago or Scottsdale, or shop online at ShopStudio41.com. The bathroom is now a place for rejuvenation and relaxation and a real pampering zone. Whether it’s a quick energising shower first thing in the morning or a long, lingering candlelit soak before bed, our extensive range of faucets, showers and accessories will let you create the bathroom of your dreams. By combining superior technology with a choice of breath-taking designs, GROHE can provide you with all the elements to enhance your bathing space. An extensive portfolio of showering solutions, bathroom accessories and flush plates complement our faucets collections – enabling you to create a cohesive design scheme in your bathroom. Orizzonti is a residential and commercial high fashion interior design company, specializing in design and installation for kitchen, bath, closet, and other room. Featuring Italian made plumbing fixtures and furniture and custom cabinetry made in the United States. A staff of experienced designers will collaborate with you to express yourself with unique products, elegant styling and rich finishes. Kitchens and bathrooms are the most renovated rooms in any Westmont home. Storage is a top concern in these rooms, so hiring Westmont, IL professionals to create and install custom cabinets in your home can be key to expanding your spaces and controlling clutter. Use the Houzz Professionals listings to find Westmont, IL kitchen and bath accessory vendors. Don’t rule out asking a kitchen manufacturer’s design team for help, too. Skills often can be overlapped to save you time and money! Here are some related professionals and vendors to complement the work of kitchen & bath fixtures: Kitchen & Bath Designers, Kitchen & Bath Remodelers, Interior Designers & Decorators, Cabinets & Cabinetry. Find kitchen and bath fixtures and accessories, plus installation experts, on Houzz. Check out Illinois kitchen products and installers, and bath plumbing products and installers, on Houzz. You can also look through project photos provided by Westmont, IL renovators, retailers and designers.